College students invariably spend a lot of time on campus. 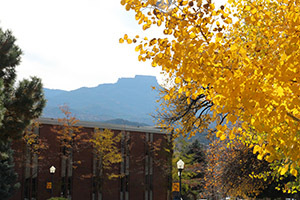 Living on campus is a great way to be part of the learning community at Trinidad State. Whether you live in one of our four Residence Halls or reside off campus the Café provides great food and a place to meet with your friends. Follow the links to check out living on campus and dining on campus. Attending college isn’t all books and homework. Really! Get involved by attending activities. They are posted every week on the website at trinidadstate.edu, Facebook, as well as on flyers in the Sullivan Center and around campus. Come over to the Student Center and play some pool, catch up with your friends, or watch your favorite TV show. It’s a comfortable place to study, get on a campus computer, or make a quick snack in the kitchenette. Student Center hours of operation – open at 9 Monday-Friday, staffed from 4 p.m. to midnight daily. Student Center Services: Pool table, four televisions, lounge space, kitchen space, computer lab, study space, Director of Student Life office. Saturday-Sunday from noon until 5 p.m.
Of course going to college means education! But do you know all there is to know about your responsibilities and rights as a student at TSJC or/and as a residence hall student? Make sure you are in the know by checking over the Student Handbook and Residence Halls Handbook. There is great information about services, policies, and expectations for the entire campus community. Don’t get caught not knowing! Follow the links to get to those important documents. If you have questions make sure you check with your Hall Director, the Office of Student Services, or with the Director of Student Life.